The Chinese, Mongolians and Tibetans have used goji berries from the Himalayan Mountains for centuries as an herbal medication. Goji berries contain amino acids, antioxidants, vitamins, proteins and complex sugars. These components of the goji berry may have health benefits. However, the full extent of these benefits are not known or fully understood. Further, currently available scientific studies do not confirm many of the purported health benefits of goji. There are several variations of goji tea. The traditional version does not use any tea. Instead, you drop the goji berries into boiling water. You then drink the boiling water and eat the berries in the beverage. Newer versions of goji tea infuse the goji berries with white or green tea. 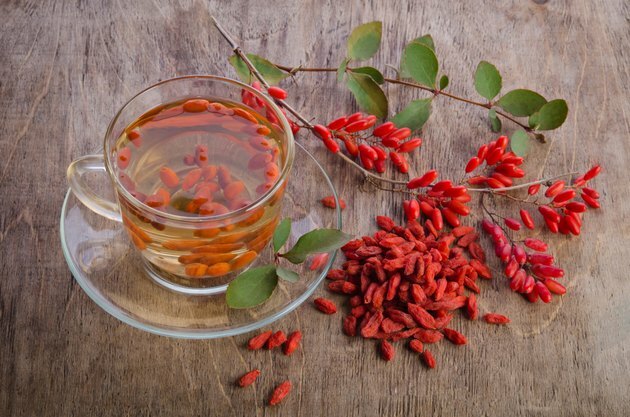 Green and white teas have antioxidant properties, so combining these teas with the goji berries increases the antioxidant properties of the beverage. The goji berry, also known as wolfberry, is rich in antioxidants. According to "The Encyclopedia of Natural Medicine," goji berries have carotenoids, flavonoids, polyphenols, vitamin A, vitamin B, vitamin C, vitamin E, thiamin, riboflavin and niacin. Additionally, the berry contains many minerals including zinc, iron, copper, calcium and phosphorus. The sugars contained in goji berries are long chain molecules that are a primary source of dietary fiber, making them a complex carbohydrate. Goji berries contain both essential and non-essential amino acids and some protein. According to the "Encyclopedia of Natural Medicine," the amino acids in goji berries have several purported health benefits including anti-fungal, ant-bacterial and anti-inflammatory properties. However, currently available scientific studies do not confirm these purported health benefits. A study published in the May 2008 Journal of Complementary Medicine found that a goji-based juice significantly increased energy levels, quality of sleep, calmness and general feelings of health in the test subject group. Additionally, test subjects also reported reduced fatigue and stress. The study noted that the test group that received the goji-based juice showed no adverse side effects from the 15-day trial.